I’m not much for the scary Halloween stuff. I’d rather stick to cute. And these are the epitome of cute! 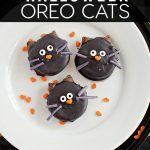 Make some Halloween Oreo Cats as a treat that your family and friends will love. I keep seeing adorable food creations all over the internet and am amazed at what people come up with. When I was at the store recently I saw the black candy melts and knew I wanted to do something with them. Then I found orange heart sprinkles. 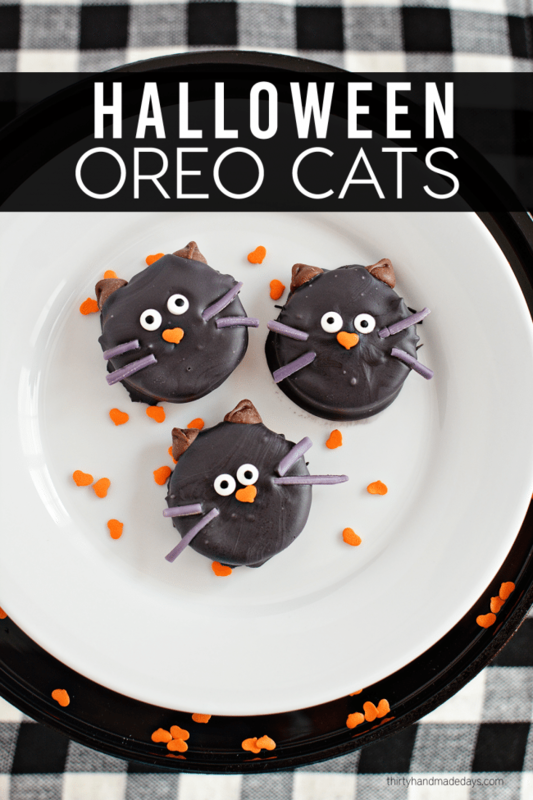 And the idea for Halloween Oreo Cats was born. Oreos – whatever kind you want! 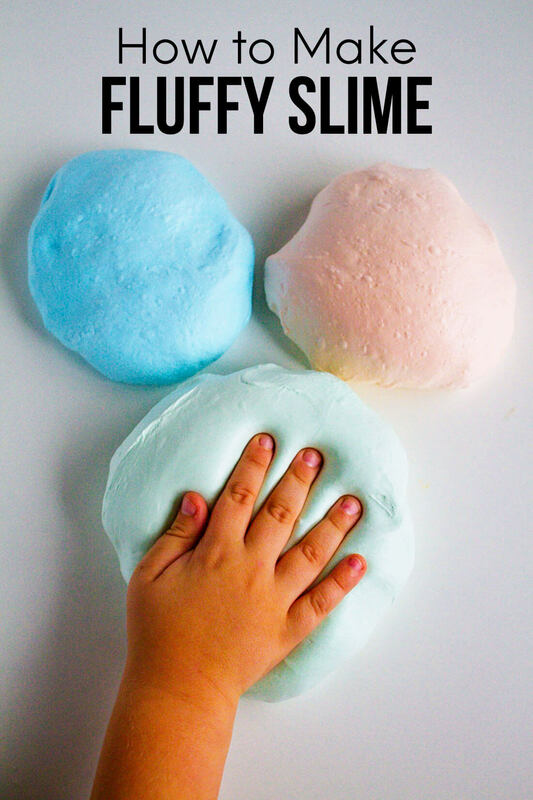 This would be a fun activity to do with your kids. I bet they’d love making their own little kitties ! 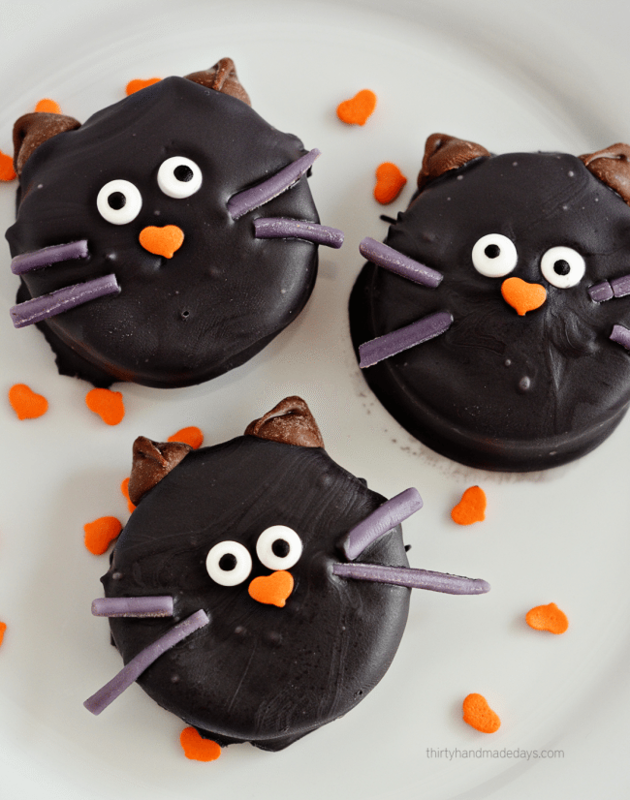 Make these adorable Halloween Oreo Cookie Cats using only a few ingredients! 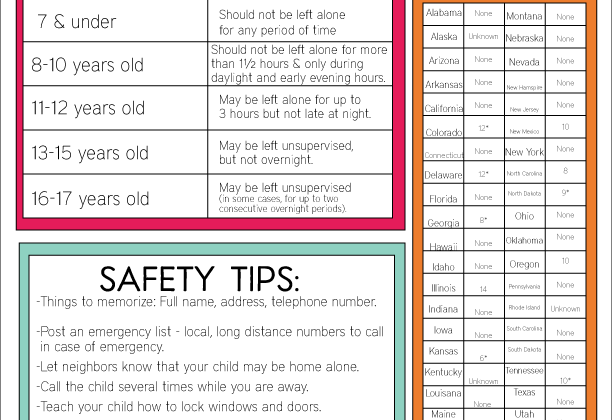 Get your kids involved in this fun activity. They will love it! Line a cookie sheet with wax paper and spray with cooking spray to prevent sticking. Unravel purple from the Twizzlers peel aparts and cut into 1/2 inch strands for whiskers, set aside. Melt black candy melts according to directions on the package. 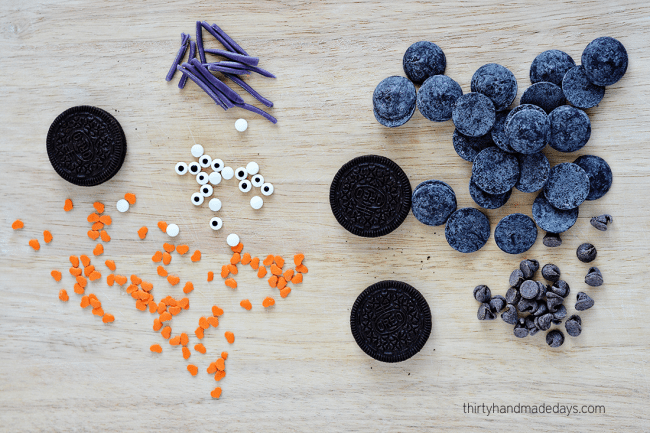 Dip Oreo cookies into melted black candy and lay on wax paper. Before the candy dries, add 2 googly eyes, 1 orange nose, 2- 3 whiskers on each side of the face and 2 milk chocolate chips for the ears on top. They would also be great to do for a classroom activity or Halloween party. And they don’t only look cute but they taste good too. Yum! Your headline that you are going to boycott Halloween really caught me! Thanks for the cute ideas!